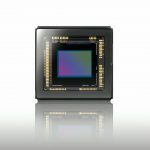 Good news for all you Fuji X10 owners, the new X10 sensor that fixes the well documented orb issue is now available (as of 30th May 2012). 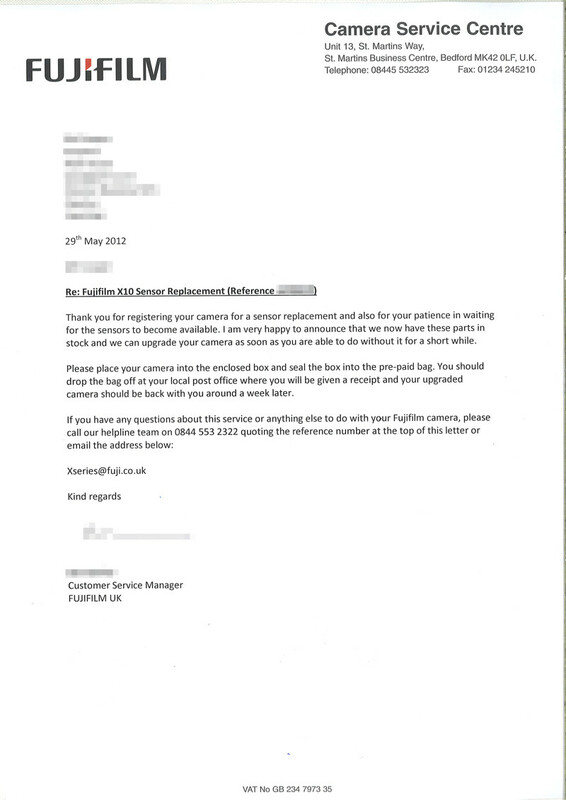 I signed up for the sensor replacement with Fuji a few weeks ago by calling Fuji UK Customer services on 08445532322 and giving them my name, address and serial number. They told me to sit tight and wait until I receive a pre-paid packaging to return my camera for the new sensor and also to clean the dust from the inside of my lens at the same time. Make sure you read more about the dust inside X10 lens problems and if you are suffering from the same with your X10 ask them to clean it when it has the sensor swap. Thank you for registering your camera for a sensor replacement and also for your patience in waiting for the sensors to become available. I am very happy to announce that we now have these parts in stock and we can upgrade your camera as soon as you are able to do without it for a short while. You will shortly receive some pre-paid packaging with instructions on how to send your camera to our service centre securely and free of charge. So far I’ve not received my pre-paid packaging but I will update this post when that arrives and also update to let you know how long it took them to replace the sensor. 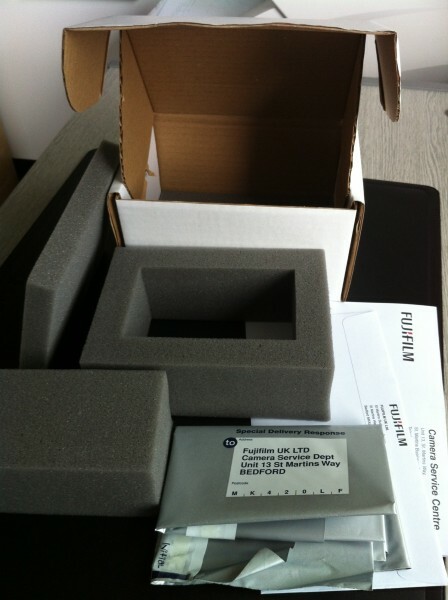 UPDATE 6th June 2012: This morning I received a sizable (10″ x 6″ x 7″), but light, brown box from Fuji. Inside is a letter from Fuji with further instructions about the sensor replacement (see scan below) along with a plain white cardboard box with foam inserts and a prepaid Royal Mail Special Delivery bag to return the camera to Fuji. The letter suggests I should have my X10 back in around 1 week so I shall be sending mine off tomorrow and will once again update this post upon it’s return. Whilst using the X10 at the weekend I also noticed that the rubber thumb grip on the rear has come lose and you can see the glue underneath it and the clear plastic focus assist lamp lens is loose too, I will be asking Fuji to address these problems along with fitting the new sensor and cleaning the dust from my lens. I’ve also just taken some repeatable sample orb photos with the X10 before it goes in for a sensor swap so keep an eye out for a post in a week or two showing before and after sensor swap photos. 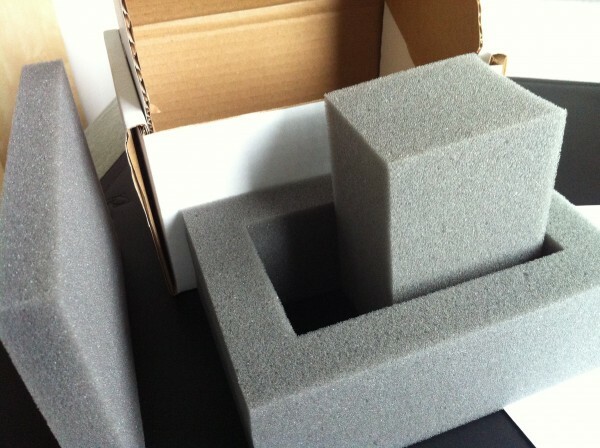 UPDATE 7th June 2012: I shipped my X10 today so let’s see how long it takes to come back. 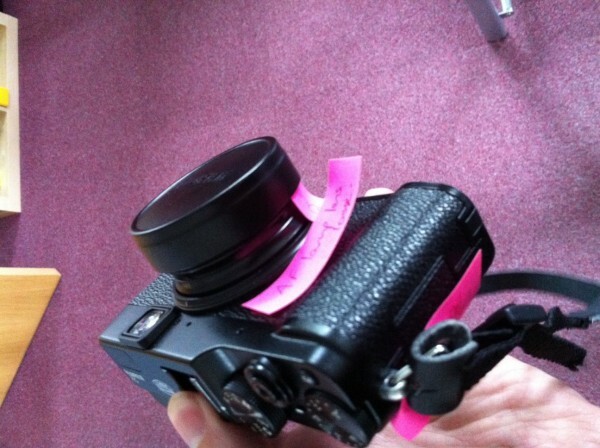 I added a few post it notes to the camera to highlight additional repairs that are needed. Your camera has now been received at our service centre. It will be repaired and returned to you as soon as possible. They should have actually received my camera the day after it shipped, 8th June but that was a Friday so perhaps it’s just been sat around waiting for the next available technician and once he started working on my unit that triggered the auto-email? Anyway, at least it’s now in their capable hands and hopefully I’ll get it back towards the tail end of this week or early next week before an upcoming holiday to Spain. UPDATE 18th June 2012: I just gave Fuji a call to get an ETA on the return of my camera as I was starting to panic that I wouldn’t have it back in time for my holiday. I was told that the work had just been finished on my X10 today and it was waiting to ship back to me so I should have it before the end of this week. Your camera is on its way back to you. From start to finish I was without my camera for 14 days. It’s a bright sunny day here in the UK (makes a change) so I’m not able to test if the new sensor has made any difference to the orbs. I shall test this evening under the same conditions as the test photos before the sensor replacement and post the results on my site. It is not a new camera it is my original unit. It still has my screen protection film on, some slight marks I recognise and the same serial number. Fuji don’t appear to have taken any notice of my request to have the dust cleaned from inside the lens. There is still a lot of dust inside the lens. Fuji don’t appear to have taken any notice of my request to fix the rubber thumb grip which is starting to peel away from the glue…it is still peeling away from the glue. One of the screws in the bottom plate of the camera seems different to the others and protrudes from the main body whilst the rest are all flush with the base. This is only a small niggle but a niggle nonetheless. Just had a call with Prague: they will find out and let me know. The thing is, Czech rep. is a small country = small market so they send Fujifilm cameras to a polish center, and even this polish center may depend of some european center:-) So that is the reason it takes longer. @Dalibor – wow that’s really bad that they’ve had it for 1 month. I’d definitely get in touch with them and ask them what’s happening. In the UK some people have shipped it on a Monday, had a confirmation email that Fuji have received it on Tuesday morning and then a confirmation email to say it’s repaired and shipping back later on the Tuesday and had it back Wednesday/Thursday. I hope you manage to track it down. I also received an email confirmation like 5 days after I sent the camera, since then the tracking website keeps telling that my camera had been received and is in the repair shop. This lack of new info is killing me, will call there today. @valentino – I’ve just updated this post today (18th June 2012) with info on my camera. I posted the camera off 11 days ago and it’s still not back with me. I did only get an email to say they received it 6 days ago thoug, I’m not sure what happened to it for the missing 5 days. I’ve just called Fuji and they have finished working on my camera and it’s awaiting shipping back to me. They anticipate it should be with me in the next few days so that should make it roughly 2 weeks door-to-door. 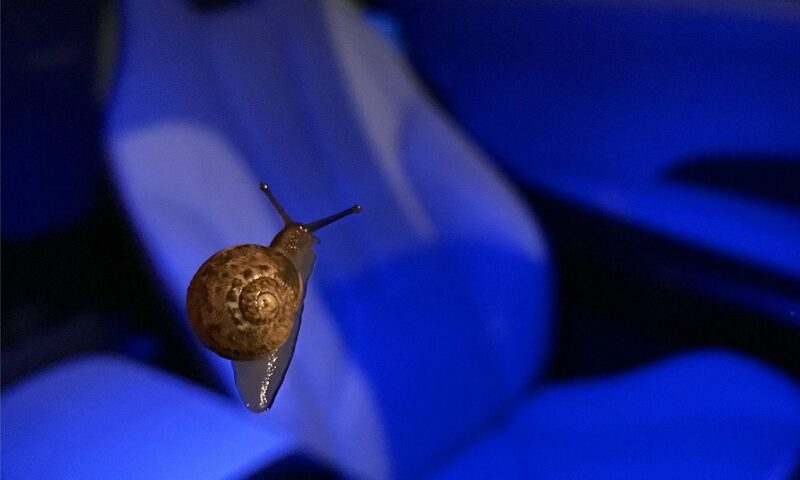 how long does it take to receive the camera back?